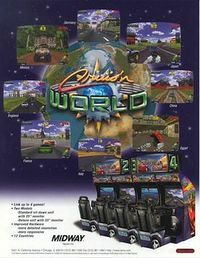 Cruis'n World is a racing game for the Nintendo 64 in the Cruis'n series, which was originally a title released for arcade machines. As a successor to Cruis'n USA, there are similar themes to the original game. Some of the real world locations include Germany, Kenya and China.